J.R. Schneider’s specialized filtration aids offer longer filter cycles, extended coolant life, reduction of waste, disposal cost, usage of filter media and other related costs. Plants using J.R. Schneider filtration aids have seen significant saving and increased production. Please contact a J.R. Schneider representative if you would like more information, or want to learn more about an Acti-Cel R® trial. Acti-Cel R® eliminates the health hazards associated with the use of diatomaceous earth (DE). Effectively removing metallic fines, oxides and soaps from mineral oil or paraffin based metalworking coolants by both mechanical and chemical processes. Acti-Cel R® is a filter aid developed and patented by the J.R. Schneider Company for use in non-ferrous metalworking and rolling. It is a direct replacement for, and eliminates the health hazards associated with the use of, diatomaceous earth (DE). It is most effective in removing metallic fines, soaps, oxides and other contamination from mineral oil or paraffin based metalworking coolants by both mechanical and chemical processes. Acti-Cel R is an acid activated cellulose fiber filter aid used in the filtration of mineral or paraffin based aluminum rolling oils. It provides the benefits of both mechanical matrix filtration and specific chemical reactions to produce results far superior to traditional filter aids. When contaminated rolling oil flows through an Acti-Cel R filter cake chemical reactions take place. The acid acts on the aluminum fines, aluminum oxides and aluminum soaps in the coolant to produce Aluminum Citrate, an aluminum salt. These salts adhere to the cellulose fiber and thus are removed from the coolant. The benefit of the acid to salt conversion allows for the removal of sub-micronic particulate that can’t be removed by matrix filtration alone. Acti-Cel R® has increased Filter Cycle time 5 fold over Diatomaceous Earth (e.g Celite) and Fuller´s Earth (e.g. Tonsil) or Perlite (e.g. Randalite) and Fuller´s Earth. 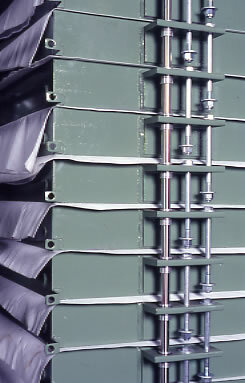 In Foil Mills, Acti-Cel R® has increased Filter Cycle time up to 4 – 5 times, typically. Reduced disposal costs: Up to 95% reduction in filter cake and Paper disposal. Filter cake waste is being sold as an excellent fuel source or composted. Cleaner coolant: 0.001% or better total ash, no additives stripping. Reduced pinhole count in foil. Increased mill speeds and reductions. Surface banding (Tiger Striping) is eliminated. Consumable costs reduced both in filter aid and filter paper. Reduced material handling and labor costs. Extended (4-8 days in most cases) filter runs allow filter indexing to be scheduled with roll changes, etc. Operator health hazard is eliminated. Automatic feeding and accurate control of on-line coolant quality provides consistent operating conditions. Coil washing may be eliminated or reduced. Guard filter usage is dramatically reduced. FDA Certified – all components are FDA Certified.